According to Gartner, almost 11.6 million mobile devices are being infected at any given time by some malicious code due to lack of security measures and proper awareness. With rapid rise in the adoption of bring your own device (BYOD) policy and considerable use of apps, there has been a spurt in the number of mobile cyber security attacks. 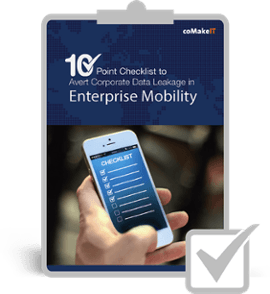 Download this free checklist and assess whether your enterprise mobile strategy is safe and secured. We have created a framework that you can use to streamline your security policies and avoid any unexpected or unauthorized loss of data, so you can focus entirely on maximizing the ROI of your enterprise mobility strategy.